This article provides tips for a typical interview of customer service personnel, including questions and suggested answers. Customer service representatives are responsible for interaction with customers via phone, email, fax, mail, or in person. They are the first point of contact of the customer with the company. It is their duty to answer queries, settle issues, handle complaints and respond to orders. Customer service representatives are needed in all fields; finance, manufacturing, medical and insurance, just to name a few. Employers rely on them to establish beneficial communication between company and customers. Question: Tell me about your qualifications for this position. Answer: Mention educational qualification, including high-school diploma or higher or any professional coursework. Also specify any relevant job skills such as written and verbal communication expertise, ability to type efficiently, professional demeanor and strong work ethics. Question: Do you have experience answering phones, handling requests, etc? Answer: Talk about relevant experience, even if it wasn’t a telephone service. Mention any job related to serving customers and interacting with clients. Speak about your ability to communicate with many customers each day while maintaining composure under a heavy workload and time pressure. Question: What sales experience do you have? Answer: The ability to negotiate and sell products may be an important part of the job. If so, mention any experience with selling, telemarketing and promotions. Question: Can you work in a computerized environment? Answer: Describe your ability to work with Microsoft Office or other relevant programs, and any computer experience, such as placing orders in the company computer or saving digital records of services and closed deals. Question: Do you have strong communication skills? Answer: You can relate success stories and any interesting interactions you had with clients, especially if it portrays good customer service skills. Explain how you have solved problems and created positive relationships with customers. Question: Describe a routine day of a typical customer service representative. Answer: List whatever tasks you perform each day. Some of these may be among them: Answering requests, responding to calls, maintaining and updating records, providing service information, dealing with misapplied payments and billing. Question: How successful are you over the phone? Answer: Mention profitable product sales, positive/fruitful customer instruction, customer care with patience and any communication which leads to improved customer service or a sale. Question: How do you interact with people? Answer: Describe your style. Put your best foot forward – if applicable, use words such as friendly, enthusiastic, informed, quick, patient, and lucid. These are just some of the commonly asked interview questions for customer service representatives. 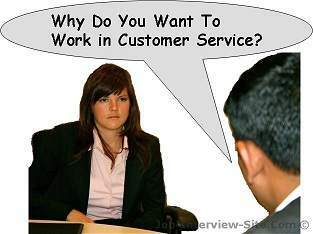 ⇛ Why Do You Want To Work in Customer Service?